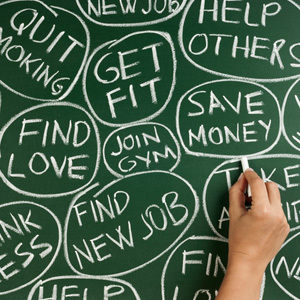 New Year's Resolutions You Can Keep - Edward Joseph, D.D.S. Did you make any New Year's resolutions this year? For many of us, these pledges reflect a sincere desire for self-improvement—whether it's in terms of our career, our personal lives, or our health. Yet it isn't always possible to keep every promise we make…and while exercising every day and cutting out desserts are worthwhile goals, they may also be very difficult to maintain. Fortunately, when you resolve to improve your oral health, there are some simple things you can do to help keep your smile looking healthy and bright. Got a minute? How about two minutes, twice a day? If so, you have time to brush your teeth properly. According to the American Dental Association (ADA), brushing twice daily with a soft-bristled brush that fits comfortably in your mouth—and replacing that brush every three to four months—is essential to good oral hygiene. The ADA also recommends flossing once a day to clean all the places where your brush can't reach—like in between teeth and under the gum line. Brushing and flossing are the best ways to maintain good oral hygiene at home. Here's another way to make a big difference in your oral health: Pass up those sugary and acidic drinks, and choose plain, refreshing water instead. We're talking about regular and diet soda, as well as fruit juice and those so-called “sports” or “energy” drinks. The sugar and acid in these drinks can spell disaster for your teeth: Sugar promotes the growth of bacteria that can cause tooth decay, while acid softens the hard enamel covering of your teeth, allowing cavities to get started. Water, on the other hand, satisfies your body's need for hydration without adding calories or harmful ingredients. That what makes it the best drink for your diet—and your oral health. There are some jobs best left to the pros—like removing the hardened deposits called “tartar” from your teeth, and checking for tooth decay, gum disease and other oral health problems. We'll take care of all that at your routine dental checkup. Plus, you'll get a thorough cleaning and a chance to “brush up” on oral hygiene techniques that can help you keep your mouth healthy throughout the year.